Learn techniques and recipes from the Michelin star chef in his most comprehensive cooking class ever. This is Gordon Ramsay like you’ve never experienced. The seven-star Michelin chef takes you into his home kitchen to learn everything from kitchen setup and buying the freshest ingredients to constructing unforgettable dishes. In this MasterClass, you’re not just learning recipes, you’re learning how to take your cooking to the next level. If you are looking to improve your cooking abilities—from simply wanting to learn how to properly cook a steak to gaining full-on professional kitchen experience—there are many online cooking courses that will suit your needs. We’re huge foodies at Online Courses Review and have spent a great deal of time compiling and evaluating the top online culinary arts and cooking courses. From healthy eating to learning how to perfectly sear shrimp, there is a course for just about any dish or technique you can imagine. If you are interested in checking out some phenomenal courses, we have prepared tasty courses that will get your culinary and creative juices sizzling! Finding time to cook (let alone learning to cook) can be difficult, though once you master the basics and learn how to budget your prep time, you will want to cook amazing, delicious meals all the time. Mastering new techniques, food pairings, and flavor profiles will impress your family and friends. If you want to go crazy, be sure to learn a little molecular gastronomy—learning how to create a gooey gruyere nacho cheese will be sure to astonish! Le Cordon Bleu (BA): Are you looking to enhance your culinary associate’s degree experience into a more lucrative career? Le Cordon Bleu, one of the most prestigious culinary schools in North America, offers an online Bachelor’s of Culinary Management that can give you the opportunity to seek management positions or jumpstart your restaurant career. You will build upon your culinary arts background to create industry-relevant skills and knowledge to jump into positions that will challenge and engage your love of cooking. If you want to learn how to successfully operate a restaurant, this program may be great for you! New England Culinary Institute (BA): Do you have prior cooking experience and want to take yourskills to the next level? The New England Culinary Institute offers an advanced level bachelor’s degree that will equip you with the necessary culinary and entrepreneurial skills to become a better chef and give you a thorough understanding of what it takes to run a successful restaurant. A few examples of courses include: Advanced Culinary Technique, Kitchen Operations Management, Advanced Food and Wine Pairing, and Culinary Entrepreneurship. A must for those thinking about expanding or starting a business. Virginia College (AAS): Do you have prior culinary or pastry arts training but want to expand your knowledge and skills to become more competitive in the kitchen? Virginia College offers an online associate’s degree that will teach you important entrepreneurial and management-level skills and help you move up in the kitchen. The program of study includes courses on: Nutrition, Purchasing, Supervision, Facilities Management and Menu Planning, Marketing and Cost Control, as well as courses to prepare you for the next step in your career. Escoffier Online International Culinary Academy: Do you want to learn from professionals at one of the best international culinary institutes in the world, without having to leave the comfort of your own kitchen? Named after the father of modern French haute cuisine, Auguste Escoffier, Escoffier Online International Culinary Academy offers an online program that will be certain to challenge your culinary chops. After you pair up with a mentor, detailed lessons will turn into live, hands-on labs where you will learn how to cook. This program isn’t accredited, but is recognized by many top culinary programs. Additionally, Escoffier Online offers career services that will help prepare you to begin a career in the food industry! Coursera: Are you interested in learning about how food interacts with the senses? Do you want to better understand how diets affect the body? Do you want to know more about how your meat gets to your plate? Coursera offers many amazing classes that will challenge and delight as you learn more about the nuances of food, diet, and sustainability. If you are looking for courses that will give you a great understanding of the importance of learning about where, how, and why your food is presented to you in the manner it is, then Coursera’s courses will blow you away! Udemy: is a comprehensive online learning platform optimized to help home cooks looking to step up their game and seriously impress with their dishes. Using video tutorials to supplement written lessons, Udemy offers a vast amount for you to learn. Quizzes will test your knowledge and make sure you take away important skills and techniques. Additionally, Udemy offers a professional certification course that can help you turn a passion into a career! All courses currently on sale! Chef Todd Mohr’s Web Cooking Classes: Do you want to learn how to cook? Does the thought of entering a kitchen terrify you? Chef Todd Mohr will calm any fear of cooking you might have and help you become a competent cook. Offering affordable, comprehensive video tutorials that span over 48 weeks of material, Chef Mohr helps you learn cooking through hands-on, interactive experience. Certified by the American Culinary Federation, Chef Mohr is an excellent instructor that offers many free tutorials and maintains a fantastic blog. Feast: Feast isn’t so much a course in cooking as it is a transformative experience in learning how to love cooking. Having spent months learning how to engage people to cook, the founders of Feast have created a cooking bootcamp that will whip you into a mess of stiff peaks and creamy sauces. With Feast you will learn how to train yourself to eat out less, build a system of cooking every day, understand the ins and outs of nutrition, and learn how to cook any recipe. If you are interested in being blown away by an amazing learning opportunity get connected with Feast! Smart Kitchen: Smart Kitchen offers over 500 hours of video tutorials. That’s almost 3 straight weeks of cooking tutorials. Needless to say, Smart Kitchen is an amazing resource for beginning, intermediate, and professional chefs alike! If you are looking to gain some serious cooking skills, these courses will be perfect. Covering topics such as knife skills, garde manger (cold foods and vegetables), proteins, stocks, soups, sauces, and cooking skills, it will be very hard for you to not walk away from these courses like a cooking pro! Top Chef University: Top Chef University is a unique learning platform that connects the hit TV show and its contestants with an opportunity for you to become a better chef. Offering 12 comprehensive courses that cover many important culinary topics, Top Chef University brings the heat from its contestant kitchen to the comfort of your own home. 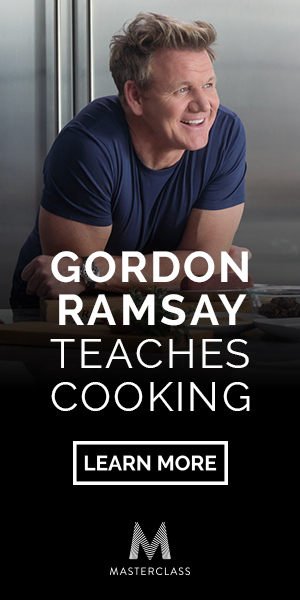 For a monthly fee, you will have access to an informative course of study that will help you become a better cook and impress your family and friends. Check it out now and start learning from phenomenal chefs! edX: Have you ever wanted to learn the science behind molecular gastronomy? Harvard offers a one of a kind opportunity to study with some of the top chefs and top scientists in the world, all while you become an experimental scientist in your own kitchen. In “Science & Cooking: From Haute Cuisine to Soft Matter Science” you will try out a new scientific experiment each week that you will eventually get to eat. This is not a course to be missed! Canvas Network: Have you ever wondered about the evolution of food culture in America? Innovators of American Cuisine: A History of the Culinary Arts in the US will look at many ground-breaking chefs that shaped food as we know it. From Julia Child introducing Americans to the joys and pleasures of French Cuisine to James Beard revolutionizing the way we eat and think about good food, this course exams the lasting marks of culinary innovators in America. The diverse contributions of these innovators has shaped and influenced not only food, but also restaurateurs, food producers, marketers, opinion makers, food writers, as well as how individuals interact with food. We highly recommend checking out this amazing course from The New School. MIT OpenCourseWare: Are you interested in the applied chemistry of cooking? Do you want to understand processes like caramelizing meat or how a cake can be so fluffy? This course examines the basics of chemistry by looking at extraction, denaturation, and phase changes—or in cooking terms, isolating flavors, turning runny eggs to soft, wispy solids, and using physics and chemistry to create a gooey, chocolaty center to a cake. This course will give you hands-on experiments to try and taste that can be taken at your own pace. ChefSteps: The chefs behind ChefSteps are quietly modest. Having written the groundbreaking, modern molecular gastronomy opus, Modernist Cuisine: The Art and Science of Cooking, which received the James Beard award for best cookbook (trust us in saying this is a HUGE award), ChefSteps creative force has teamed up to bring you phenomenal molecular gastronomy classes online for free. ChefSteps will teach you techniques such as sous vide, spherification, foaming, and much more. If you have had even a remote interest in learning about the science behind cooking, you cannot miss these amazing tutorials! Spork Online: Are you fed up with trying to find vegan cooking courses online? Sisters Jenny Engel and Heather Goldberg have compiled over 30 one-hour, vegan cooking courses and over 150 original recipes for a one-time price of $29.95. Becoming vegetarian or vegan can be hard, especially if you aren’t used to preparing veggie-centric main courses. These courses will ease the transition of cutting out meat and teach you many amazing cooking techniques as the same time! If you are interested in wanting to cut animal products from your diet or are looking for amazing vegan recipes, these courses will be perfect for you. Epicurious Cooking School: Epicurious, the astute recipe and food website, has collaborated with the Culinary Institute of America to bring you 4 courses in Mexican Classics, American Classics, Italian Classics, and Mediterranean Classics. Each course consists of 8 classes and will have between 4-5 hours of video instruction taught by professional culinary professors at the Culinary Institute of America. Each class contains thorough video instruction as well as detailed recipes and multiple-course meals. A must if you want to learn a specific kind of culinary culture! Russell James—The Raw Chef: Are you looking to get rid of processed foods and switch to a raw food diet? Renowned chef, Russell James, can assist you with your transition. Offering 4 comprehensive courses in learning different levels of raw food cooking, Russell James offers more of a lifestyle guide than culinary resource. His scintillating videos present the means to better your life through natural, healthy eating. Additionally, his recipes and cooking tips will ensure that you are able to eat delicious and nutritious food. A must for those looking for a lifestyle change!